In the 1899 publication Beautiful Highlands of Los Angeles, promoting Boyle Heights, Brooklyn Heights and Euclid Heights and issued by the Ninth Ward Improvement Association, almost all of the people and buildings discussed and visually presented were middle and upper middle class Americans and Europeans, like the target audience of the pamphlet who were solicited to come to the neighborhood. Only a few people of color were mentioned in the booklet including Kiu Sing Chan, highlighted in a previous post on this blog. Another was J.A. 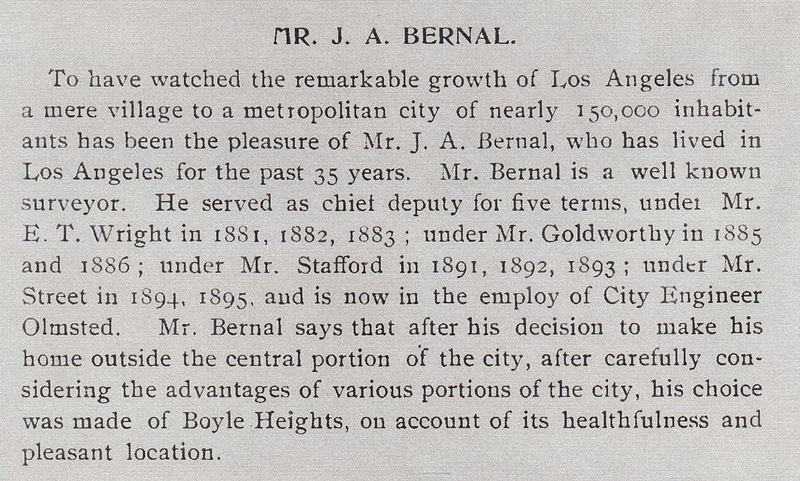 Bernal, who brief biographical sketch noted that he had been a resident of Los Angeles for 35 years (that is, from the middle 1860s) and that he "is a well known surveyor" who was chief deputy for the city surveyors for most of the period between 1881 to 1895 and who was then working for the city engineer. As to why Bernal settled in the neighborhood, the sketch stated that, "his decision . . . [was] on account of its healthfulness and pleasant location." 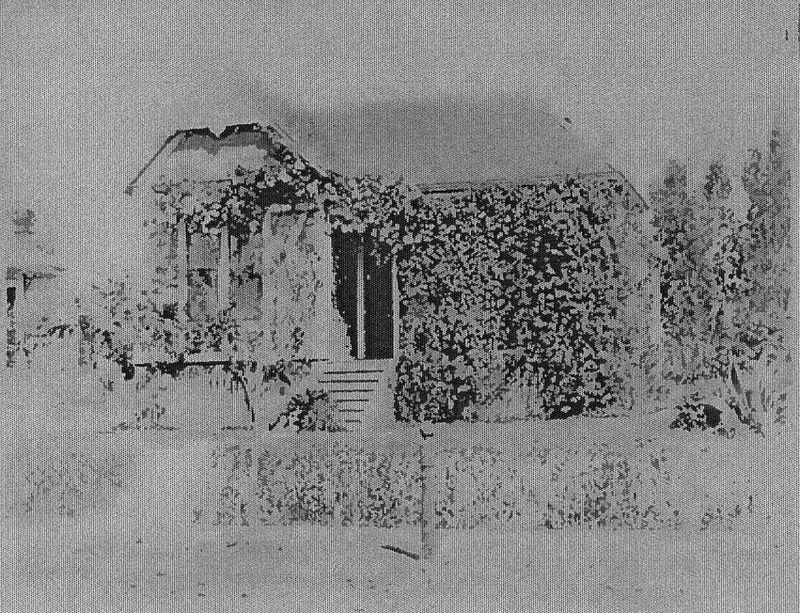 Bernal's home was one of a quartet of residences shown on a page of the publication, including that of Kiu Sing Chan and it shows a small cottage with a projecting front room, a porch across three-quarters of the front elevation, and a profusion of climbing vines covering the porch and extending over the entrance towards the front room. There even appears to be a hitching post near the street--automobiles were some years away from being in use. Because the publication was downloaded from the Net, the image shown here is sketchy at best, though some cleaning up was attempted to make the image a bit clearer. 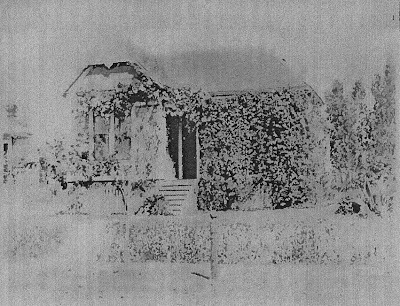 The Boyle Heights cottage at 1619 New Jersey Street of José Adolfo Bernal, longtime surveyor and civil engineer for the city of Los Angeles, from the 1899 booster pamphlet Beautiful Highlands of Los Angeles, which promoted Boyle Heights, Brooklyn Heights and Euclid Heights. A little digging into Bernal revealed some more details about him. José Adolfo Bernal was born in 1857 to José María Bernal, a native of Sinaloa, Mexico, and Serafina Uribe. The comment in his biographical sketch from the pamphlet about how long he'd lived in Los Angeles seems to be in error, because the 1860 census showed the Bernal family residing in Los Angeles, where José María Bernal working as a plasterer, probably for adobe structures, which then predominated in the town. By 1870, José Adolfo was in San Francisco attending St. Mary's College, a Catholic boys school (the use of "college" in those days could mean students from grammar school age and up) that moved to Oakland in 1889 and then in 1928 to the suburb of Moraga, where the school still operates. A decade later, he was living with his mother Serafina (the elder Bernal died in 1866) on First Street in Los Angeles and had already been engaged in the surveying business. The following year he began his duties as chief deputy surveyor for the city. In 1880, Bernal married María Constancia Machado, from a prominent family who resided in the area near today's Los Angeles International Airport. The couple went on to have a daughter, Rosa, and three sons, Eduardo, Adolfo and Alfonso, two of whom followed their father in the civil engineering and surveying trade, while the third, Eduardo, was a bookkeeper in the city department. It is said that Bernal specialized in surveying land grants of rancho made under Spain and Mexican rule and he also had a surveying business with George Fisher, much of the archival material of which is deposited at the Seaver Center for Western History Research at the Natural History Museum of Los Angeles County. Maps worked on by Bernal can also be found at the Huntington Library, including a beautiful and ornate 1888 rendering of the "Workman Orchard," the property of Boyle Heights founder William H. Workman on the west side of Boyle Avenue on the bluff overlooking the city. The short biographical sketch of Bernal from the pamphlet. 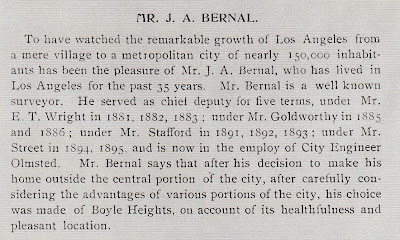 Bernal was also treasurer of the local chapter of the Sons of the Golden West and invested in some property in what was then called East Los Angeles, now Lincoln Heights. He died in 1927 after a long and fruitful career with the city. His home, which was at 1619 New Jersey Street just to the west of White Memorial Hospital, continued to be owned by his family for years afterward but is now gone. Contribution by Paul R. Spitzzeri, Assistant Director, Workman and Temple Family Homestead Museum, City of Industry, California. Thanks to Rudy Martinez of the Boyle Heights Historical Society for locating a copy of this pamphlet online.